Learning List will be presenting a session titled “Unpacking the Standards in the Transformative Classroom” at the Texas ASCD’s Ignite15 conference at the Irving Convention Center – 10:30AM today in the Junior Ballroom A1. 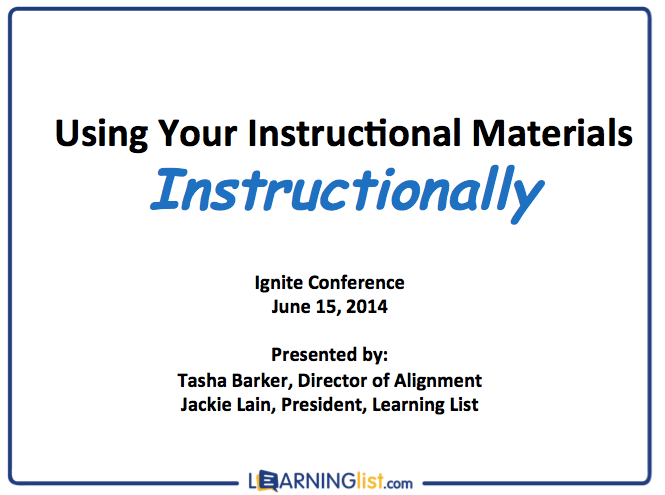 The session will discuss how to “Use your Instructional Materials Instructionally.” Tasha Barker, Director of Alignment at Learning List and Texas ASCD Board of Governors, will be c0-presenting with Jackie Lain, President of Learning List. Texas ASCD’s Ignite15 is a 3-day event that offers K-12 educators and administrators the opportunity to network with and learn from internationally recognized presenters in hands-on groundbreaking sessions designed to transform curriculum with technology integration. This conference and its focus on digital learning will give you the spark you need to develop innovative plans to implement at your school or district. Click here for a digital schedule of other sessions and events at Ignite15.